So I was going to finally get something posted here, and go to download my pictures and what do you know? I have lost the USB cord to my camera. That's what I get for cleaning my office isn't it? Darn it. So, until I tear the place apart and offer a monetary reward to the 3 year old who most assuredly took it, I am going to show you another one of my hobbies. 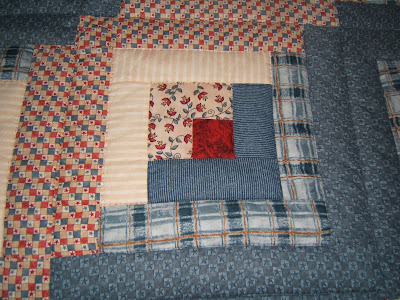 This is a log cabin quilt that I made in 2001. It was the first quilt I ever pieced together. When I got done my grandma graciously hand quilted it. Definitely stitched with love. I'm still not sure how she can do that, but she is amazing. I don't think it even took her long. I have a few cute cards I am dying to post so I will try to find that blasted cord....maybe I need a new camera?!?!?! That is amazing! 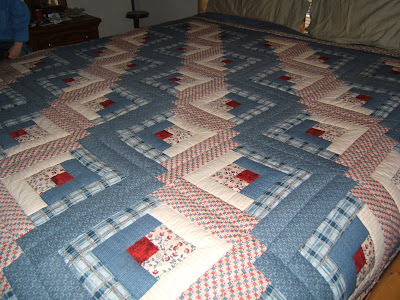 I've dreamed about making a quilt for my bed--even looked at the log cabin pattern, but always change my mind before I start :) I can sew, but I've never pieced a quilt. Em, that is so beautiful! I keep shopping for a new bedspread, but I hate everything at the store, what I really want is a cute quilt like that, I love quilts, but the ones at the store use ugly colors. I think I need to break down and make one. I love the colors and fabrics you chose, so cute! It is GORGEOUS!! I made only two in my lifetime so I know how difficult it is and how especially hard it was to pick the fabric, I am very chalenged in that dept. But, yours is just luxereous to look at! By the way...I remember when my SON lost my USB, and right around the time my computer blew and I lost everything that I had backed up. It was all in the timing that killed me!! Gotta watch out for those boys!